Always wanted to try spinning but don't have a spinning wheel? Why not try a drop spindle? Early tools for spinning fiber, drop spindles continue to be used by many spinners in many cultures around the world today. They're portable and inexpensive and if storage is a challenge, they are very space efficient. Although plenty of modern spinners flat out prefer the drop spindle for spinning, many wheel spinners value them for their portability. Drop spindles travel well. As for the yarn, some spinners favor them for spinning fine yarns. There are many drop spindles on the market today. They come in a wide range of materials and prices ranging from simple and inexpensive to beautiful handcrafted treasures. But because I'm often somewhat reluctant to invest in a new fiber tool until I think I'm going to like the craft, I suspect many others may also be. One way to find out if you'll like drop spinning is to make your own. The materials are inexpensive and readily available. Assembly is easy--only a few steps to a fully functioning drop spindle. 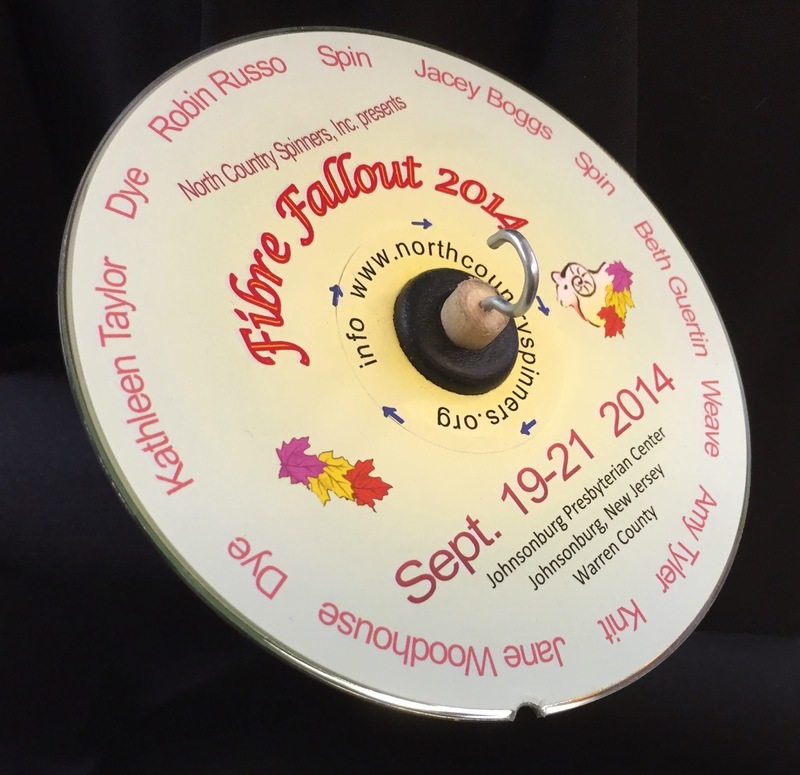 I have one that was part of the welcome packet at North Country Spinners Fibre Fallout 2014. 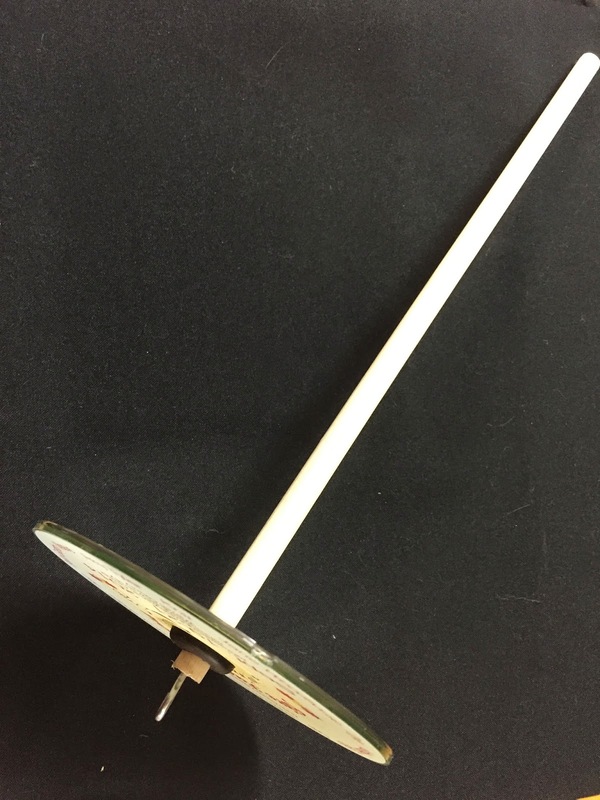 With full credit to the clever North Country Spinners who created this particular DIY drop spindle, it is simple enough for some reverse engineering. One dowel, 3/8" diameter, cut to a 12 inch length. An abrasion tool, such as a Dremel tool, to make a small half-round notch on the CD/DVDs. Lightly sand the cut ends and sides of the dowel to remove any rough edges. Screw the cup hook into the center of one end of the dowel. Stack the two CDs/DVDs together. Fit the rubber gasket into the hole in the CD/DVDs, making sure that the CD/DVDs fit into the gasket's grooves. Fit the dowel through the gasket's center hole. This should be a snug fit. My spindle's dowel extends slightly less than 1/4" above the gasket to the cup hook . Voila! Now you have a drop spindle and you're ready to spin. What next? 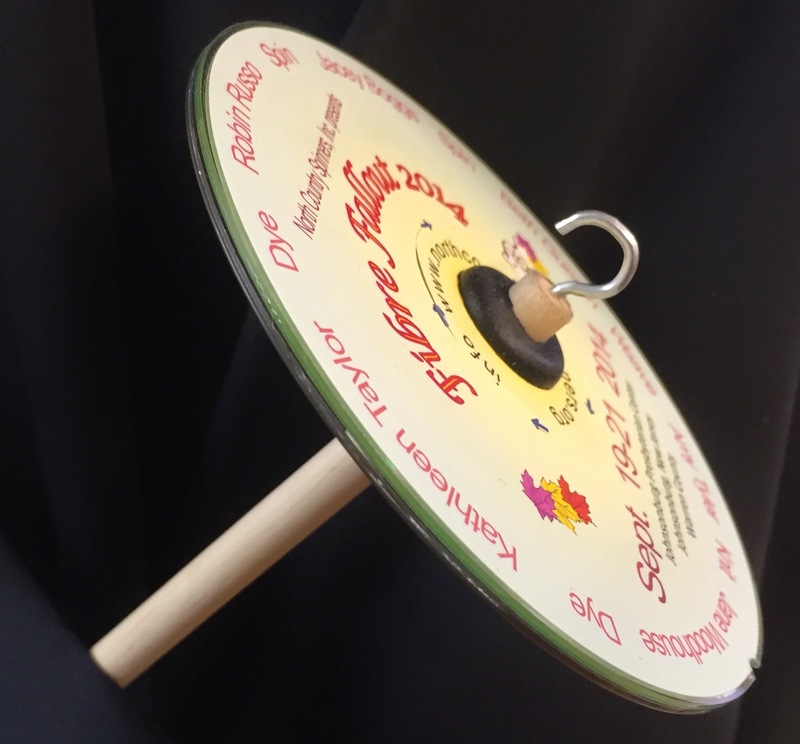 Ideally, find a spinner who can drop spindle or visit a drop spinning demonstration. Spinners are keen to share their love and frequently demonstrate at fiber shows around the country. Guilds such as the South Jersey Guild of Spinners and Weavers and the North Country Spinners are good resources and often participate in local festivals to demonstrate and teach their craft. Not in the area? Find a local guild or check out your local yarn shop for direction. If all else fails, there are a number of videos online such as the YouTube video produced by Paradise Fibers.